The police force remains silent on the role of one of its ranks in the fatal shooting of Elvis Fernandes, whose father says the conflicting accounts about his death suggest that there is more to it than anyone is saying. only to be told that the commissioner would be unable to see the reporters. When questioned about a date for a follow up visit, an officer told the reporters that the commissioner would not be seeing them and that he did not say when it would be possible to do so. The police, in its only statement on the matter, suggested that the shooting, which occurred last Friday evening, had its genesis in a dispute between the driver of a mini-bus and the driver of a car, who had an argument earlier at Mandela Avenue as a result of an accident involving the two vehicles. The drivers later crossed paths again along Mandela Avenue, where the bus driver stopped to put off a passenger and another argument arose. On this occasion, Fernandes and a plain clothes policeman were in the car. This was around 6:45pm. Elvis, the police had said, became involved in the argument along with the driver of the car and was shot to his chest by a passenger in the bus, who had begun discharging rounds from a firearm. The policeman, who was making efforts to pacify the situation, responded and discharged a round from his service firearm which struck the armed man, the statement had said, adding that that the armed man re-entered the mini-bus and was taken to the Georgetown Hospital by the driver. 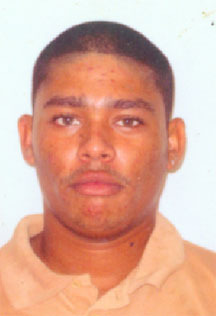 The injured man Lloyd Britton, 20, of Beterverwagting, East Coast Demerara, is a patient of the Georgetown Hospital. Britton has denied that he was armed at the time of the shooting. He had told this newspaper from his hospital bed that it was the police who discharged three rounds at the bus and Fernandes was hit by one of the bullets. For the first time yesterday Fernandes’ relatives spoke out. Stabroek News met with a grief- stricken Eugne Fernandes at his West Ruimveldt, Mandela Avenue home and he said all the evidence indicates that there was more to his son’s death. From all indications, he said, it was the policeman who shot his only son. The policeman, he noted, is among his son’s friends and would visit his home regularly. The elder Fernandes recalled that he left home around 4 am last Friday, leaving Elvis, 23, in charge of his upholstery business. Since the young man had left school, he had been assisting his father. The elder Fernandes said he left instructions with his son to collect money from several customers who were due to visit. He later spoke with Elvis over the phone and he indicated that one customer had already visited. He said that he told his son not to leave home as another customer would be coming. “He said, ‘Okay. He ain’t going nowhere,’” he recalled. It was not long after that he learnt that his son was shot. Fernandes said that later he was told that Elvis, his police friend and another friend who lives a few houses away left and went to follow up a car accident. The man stressed that the whole account was strange as the car accident in question occurred three weeks prior to the shooting. It had originally been reported that the accident occurred the same day as the shooting. Eugne said that when he later spoke to the policeman and the other friend, they kept giving conflicting versions of what happened. According Eugne, the two told him that they and Fernandes “went to beat up the people”. He described his son as a person who would represent a friend who is in trouble. “But I can’t see a car mirror…why the policeman shooting?” he said, adding that “this is a premeditated something.” Asked why the policeman might want to kill his son, the man said that he is still trying to figure that out. He said that his son and his friend had fallen out and only began speaking once more to each other earlier in the year. The man said that four or five months ago the policeman suddenly appeared. He said that he does know the rank’s name but knows he is attached to the Criminal Investigation Department at Eve Leary. Fernandes said that while at the hospital, he took a look at Britton and concluded that he was not the shooter, given the young man’s height, size and the part of the body where his son was shot. “I ain’t buying that story ’bout that boy (Britton) shooting. That boy is an innocent lil boy. That boy get shoot to cover-up what he [the policeman] do,” the man said, while adding that he doesn’t even believe that Britton was armed. Fernandes said that he is being faced with more questions because the two friends keep lying. He said that they told him that when they “race up the road behind the bus, the bus man swerve in front of them and a boy come out de front seat and start shooting at them.” He said that there are no bullets holes on the car to confirm their story. He said that a passenger of the minibus who witnessed the shooting told him that when his son and his friends came out of the car, Elvis’ friend who lives in his street lashed the bus with a cutlass and went around to the driver’s side of the minibus. He said that based on what the woman told him, it was the car that drove in front of the minibus forcing it to stop. He said that when he saw his son’s body in the morgue, no one could find the gunshot wound. He said that his son is a tall man and was shot at close range. He said that if his son was shot by Britton, “the bullet hole would not have been like that,” given the distance between the two men. He insisted that the person who shot his son was standing very close to him. He insists that his son was shot as soon as he exited the car. He added too that his son was shot on the right side and had Britton been the shooter, he would have been shot on the left side. “I don’t think this is no accident,” he said. “There is something else wrong. There is something wrong between them,” he added. Britton and his son did not know each other, he noted. Fernandes said that he has no justice to get as the policeman was in possession of his firearm the day after the shooting and was walking freely. According to the man he cannot understand how the police force is operating in investigating the case. “I don’t know how he could get back he gun,” he said, while adding that he doesn’t know how to approach this situation. He said that his main focus right now is burying his son. He did, however, add that he would try to stop any attempt by police to charge Britton with his son’s death. “Even the most stupidest policeman can see that if a man jump out of a car and going in this direction (west) he cannot be shot in his right side,” the man stressed. He noted to that he had heard nothing about a second gun. He said that what is also strange is that his son’s cell phone was shattered and his motorcycle key and a gold ring he was wearing are missing. “There is something to it but wha I really can’t say,” he said, noting that he will find out what really happened. He said that when the policeman went to see him at his home, he had his weapon in his pocket. He said that the policeman went to him with a confrontational attitude and was bowing his head as he spoke. He said that his demeanor alone told him that the policeman knew more than he was saying. He said that his son is not involved in any bad business. “My son does do upholstery wuk,” he noted. Elvis, who also leaves to mourn his mother, three sisters, a five-year-old son and his reputed wife, who is pregnant, will be buried on Friday.